Kellogg’s acceptance rate is on the higher side for a top 10 MBA program at over 20%. But don’t be fooled, getting into Kellogg is still very difficult. In addition to high expectations for GMAT and GPA, Kellogg allows all applicants to interview. This allows Kellogg to find candidates with the best interpersonal skills even if they don’t have high scores. Since I don’t have information on candidates’ interpersonal skills, I’ll stick to GMAT and GPA. I built a model that can estimate an applicants chance of admissions to Kellogg based on a few key pieces of data . I am posting the insights I found in the model here until I am able to build the admissions calculator over winter break. The average GMAT score for Kellogg’s 2 year MBA program is 717, however the average GMAT for applicants is lower, coming in at 709. 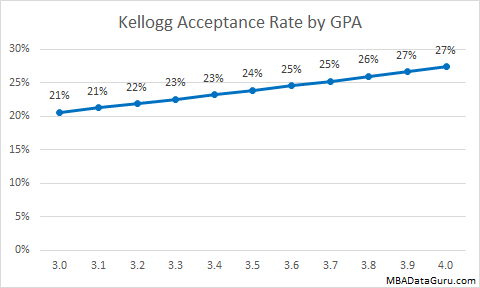 The graph above shows the relationship between GMAT and Kellogg acceptance rate for the average applicant, who has a GPA of 3.38. 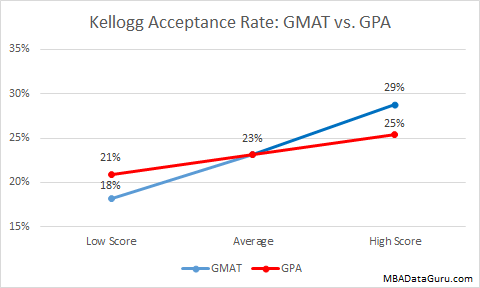 You can see there is a strong relationship between GMAT and Kellogg acceptance rate. An applicant to Northwestern has twice the chance of getting in with a 750 compared to a 650. Similar to GMAT, having a higher GPA increases your chance of admission at Kellogg. Even with a low GPA of 3.0, the admission rate is still over 20%. 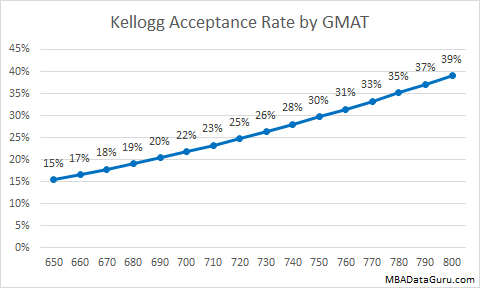 The graph above shows Kellogg acceptance rate by GPA for the average candidate, who has a GMAT of 709 (yes I know that it is not a possible score). By comparing admissions for candidates with a high GMAT score vs high GPA, I found that Kellogg prefers a high GMAT over a high GPA. * This is good news for candidates who are willing to put in the hard work to get a high GMAT score. Having a high GPA only increases your chance of admission by 2% to 25%. On the other hand, having a high GMAT increases the Kellogg acceptance rate to 29%. On the flip side, if you have a low GMAT then it will harm your chance of admission more than a low GPA. 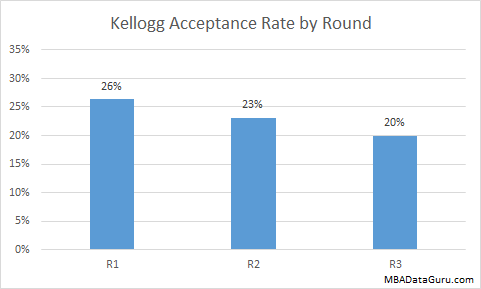 Round 1 applicants had the highest acceptance rate, with round 3 acceptance rate the lowest. These numbers are a little misleading because they don’t take into account difference in the average candidate quality for the different rounds. The lower acceptance rate for Kellogg applicants in later rounds is explained by lower GMAT and GPA. This is why application round is not a factor in my admission model. Applying in a later round does not appear to harm your chance of admission at Kellogg significantly, especially if you can use that time to raise your GMAT or improve your essay. The last two factors that had an impact on admission rate were country and industry. Applicants who were living in India had a roughly 6% chance of admission. Candidates who worked in computer software while applying had a 5% chance of admission. Both of these factors were statistically significant, meaning that there was enough data to verify the effect. Good luck with your applications! Let me know if you have any questions. *A high score on GMAT or GPA is defined by one standard deviation above average. This entry was posted in Admissions, GMAT, GPA, Kellogg and tagged Admissions, GMAT, GPA, Industry, Kellogg, Major, MBA, Work Experience on December 15, 2014 by Data Guru. I am a first year MBA student at NYU Stern school of business. Before business school I worked in marketing strategy and analytics. I am looking to transition into management consulting. What is the estimate for 720 GMAT and 3.7 GPA? My prediction for you is 31%, which is a lot higher than the average acceptance rate. Thanks, MBA Data Guru! Could you possibly delete my first comment as it has my full name in it? I’ve reposted it below without my full name. BTW, shoot me a private e-mail and I’ll update you as I hear from schools this week so you have more data. Love your recaps! Take a stab at my Kellogg or Ross (interviewed at both) chances if you’d like: 710 GMAT, 3.67 GPA from public ivy (think UVA/Berkeley/Michigan), want to go into corporate finance, will have 5 years work experience, white, and female. Sorry to hear that, good luck with any other schools you applied to. How does length of Work Experience affect the model? Good question, at many schools longer work experience seems to help your chance of admission. At Kellogg work experience is not statistically significant factor. With those scores, your predicted acceptance rate is 31%. Unless you are currently living in India or working in computer software in which case your odds are much lower. Hey man, how does a combo G 730 and GPA 3.34 gives me? I worked in financial for 4 yrs and it’s from Canada. thanks man, how about Ross? I can’t take into account what school you went to but I’m sure having gone to IIT will help. Is 7.5 considered low, average or high? If I assume that it is average then you have an 8% chance of getting in. Applying from India is pretty tough, good luck! I will certainly be doing one for Duke. I have one more exam tomorrow then I can dedicate more time to finishing these analyses. Should be done before New Years but hopefully sooner than that. R1 decision is this Friday. But will be glad to see the analysis anyway. Well that gives me a deadline. I’ll try to finish it tomorrow then. Good luck!! What about 770 and 3.1? Thanks so much for doing this blog. It is a great resource! You have a roughly 31% chance of admission. Good luck! what about a 670 gmat, 3.52 gpa, white female working in insurance/healthcare? My model predicts that you have a 21% chance of being admitted to Kellogg. Gender isn’t in the data set I have, so that is not factored in to my prediction. I have heard that acceptance rates for women is noticeably higher for women, so you are in a good position with Kellogg. Make sure that your resume and essays are top notch. Hi..How about 670 GMAT, 3.61 GPA and 8.5 years of experience in Oil and Gas Projects. Hi Sidharth, I would be happy to predict your odds of acceptance. I need a little more info so I’ll reach out to you by email. What about 720 GMAT, 3.28 GPA male applying in Round 3? I’m from the US, not working in computer software. My model predicts that you have a 27% chance of getting into Kellogg. Good luck! What about 690 GMAT, 3.96 GPA, 2 years teaching, 2 years management consulting? Hi Elizabeth, the model predicts you have a 27% chance of getting into Kellogg. Good luck! Hi, could you predict Gmat 670 (V 35, Q 46), GPA 3.44, Indonesian female with 5 months private equity and 2.5 years banking experience? Hi Mons, with your stats, you have a 21% chance of getting into Kellogg. Good luck! 750 GMAT, 74.6% (top 5-10%) Mech engineering UG (school: Delhi college of engineering, India), Masters 3.53 (Mech Engg., McGill University, Canada), 3.5 years WE, Indian but working in Canada for 3.5 years (team lead currently). I’m not sure how top 5%-10% converts into a US GPA. I’m assuming that is similar to a 3.8, let me know if you have a better idea of the equivalent GPA. The model predicts a 10% chance of acceptance. Unfortunately Kellogg has a really low acceptance rate for Indian citizens. Your best bet is to ace the interview, check out my article on the Kellogg Interview to prepare. Hey Thanks for the reply. I think your model will be made more robust by correlating your percentages by actual admits of students for whom you made predictions based on your model. To me , your model is based on a highly skewed Indian applicant pool (probably basing your model on Indian candidates who would’ve found it hard to make it because their overall profile was not strong enough or they were not able to show FIT with the schooletc). I say this because I know quite a few Kellogg alumni who were from India and made it in the past 3-4 years. So a 10% is a bit hard to digest with my profile but as it is your model, I will take your assessment and suggestion for doing great in the interview under due consideration. I will definitely report back to you how my interview goes. I agree with everything you say. There are probably a lot of people applying from India without having visited the school and ensuring fit, if you have taken those steps then you have a much better chance. All I can do is work with the data I have at the moment, if I am able to collect more detailed data in the future then I will update my model. My model predicts you have a 28% chance. Best of luck with your application. Indian Female IT Engineer, 740 GMAT, 8.49GPA from NIT, 3yrs experience. What are my chances? Is that 8.49 out of 10? I have heard that anything north of 6 out of 10 in India is roughly equivalent to a 4.0 in the US, is that accurate? Hi there, Indian male, 7 years in Business Operations Consulting. 770 GMAT. 3.3 GPA. Already have an Indian MBA in Operations and Engineering degree in Computers. My model is predicting your chance of admission is 10%. Many US schools won’t admit you if you already have an MBA, so be sure to check with Kellogg before you apply. Loved your statistics. Can you suggest my chances at Kellogg. I am an Indian working in Singapore from last two years (Total work experience 8.5 by June 2016). GMAT is 740 (Q50, V40) and Undergrad GPA is 3.5. One down side, I work in IT Consulting but have consulted Securities Markets, Risk and Mortgage clients. Hi Jeetu, my model predicts you have you have an 8% chance of acceptance. What about a 25 year old, white female. Graduated from a public ivy with a 3.9. GMAT is a 700 (50Q, 34V split). 3+ years working in global analytics. Applied Round 1 to Kellogg. My model predicts you have a 29% chance of getting into Kellogg. It can’t take into account the quality of your undergrad university, so that would probably raise your chances slightly. Good luck! I am an Indian male and my GMAT score is 660. Under-grad ( 3.5 GPA ) , Masters ( Software Engineering ) – 3.6 GPA .I worked for top MNC for 3 years as a consultant and then I started my social enterprise that aims at providing sustainable livelihood opportunities to aboriginal women.My success story have been covered on various magazines in India and abroad. I am well aware that Kellogg prefers social entrepreneurs.I would greatly appreciate if you could evaluate my chances of getting into Kellogg. Can you predict Kellogg acceptance rate for following profile..
Hi Rea, my model predicts you have a 9% chance of getting into Kellogg. Good luck! What about 730 with 3.6 GPA at non-HYP Ivy? 5 years WE at matriculation in big name ecommerce businesses. American female. I would be happy to help you out. I just emailed you for more information. Hi MK, I would be happy to estimate you chance of acceptance but I need a little more info. I emailed you with the specifics. Would you mind calculating my chances with your model? Thai, working in supply chain with 3years WE. Hello, I have a 600 GMAT, 4.0 gpa and 8 years experience in Renewable energy – no time to retake the gmat. I have a great story starting by graduating at 20 years of age with a masters in engineering, top of my class – what are my chances. I currently have an offer from purdue and wondering if i should wait to apply to kellogg next year? Really like your analysis. GPA 3.8 and 680 GMAT. I’m a female dentist from India. please suggest what are my odds? Does work ex affect the acceptance? I have 2 years of experience with a few gaps. Really like your analysis. I am a female dentist from India with a 3.8 GPA and an experience of 4 years, with a gap year. My GMAT is 700. Could you please suggest what my chances are? Why is the acceptance rate for computer software so low? Is there a difference between IT Consulting vs computer software? Thanks! I don’t know the why, only what I am seeing. I would guess that the people skills for computer software applicants is lower or that more are applying than Kellogg wants to accept. I would imagine IT consulting applicant would have more soft skills than computer software applicant, so I would imagine that would help. 710 GMAT, 3.6 first MBA GPA from Pakistan, 6 years work experience, what do you think my chances at Kellogg are? Check out the admissions calculator. There is a link in the navigation bar above. Does this mean that applying in round 2 gives lower GPA GMAT students a better chance of getting in? My interpretation of the data is that round 2 acceptance rate is explained by the fact that the stats are slightly lower. I have 3.8 years of work exp of which 2 year exp is in big4 audit. 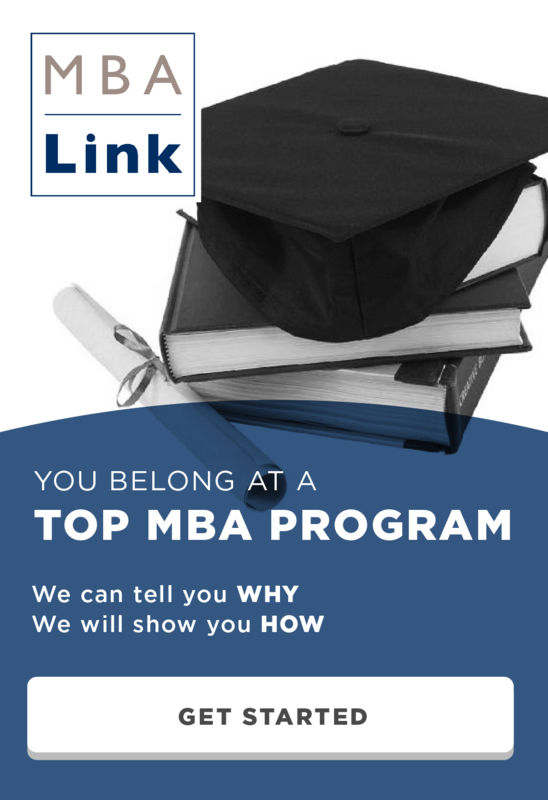 What do you think are my chances for kellogg MBA? How different it is for indian candidates who already have a masters in the US and have been living in the US from the last 6 years? GMAT – 720, WE – 4.5 years, Already a masters from Penn State University, GPA – 3.5 from India/3.24 from PSU. Significant community experience in India and a lot of leadership opportunities in the US. Sorry, I don’t have that data. Best of luck with applications.